At St. Casimir’s School Wells, Minnesota, teachers like to give lots of feedback to students through detailed grading criteria. The school uses a quarterly grading system, so their report card is a condensed two-column, four-term report card with plenty of space for lots of grading information. Let’s take a look at a sample! 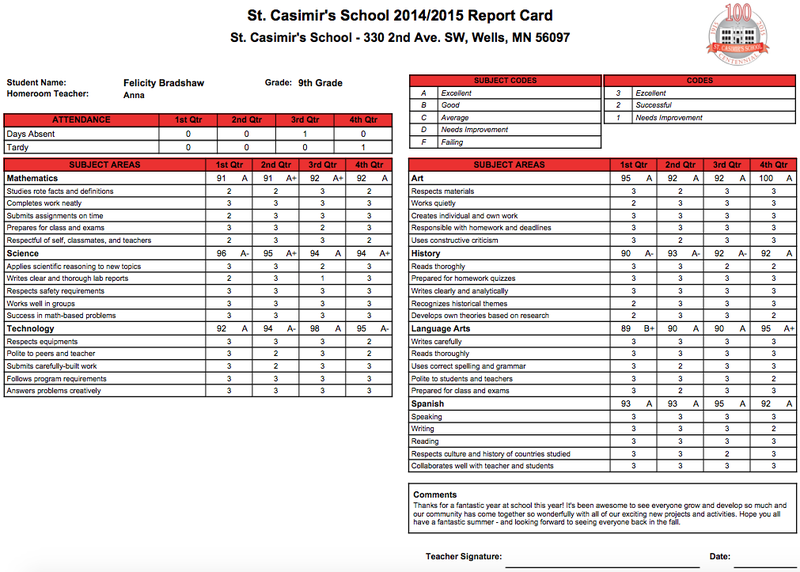 If the St. Casimir’s template looks good to you, please feel free to chat in and request it for your school account. We would be thrilled to enable it for you, as well as help set it up. It’s a very detailed and informative report card – feel free to give it a try! This looks really nice and clean.